Do Less Sanding! 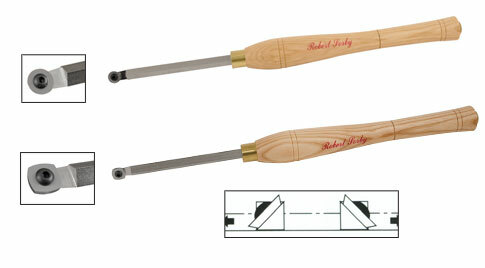 These shear scrapers from Robert Sorby allow you to get a very smooth finish right off the tool. They are also great for final refining of the shape. The square of the tool shank is set in the handle at an angle to automatically hold the cutter at 45˚, producing fine super thin shavings. Endgrain tearout will be a thing of the past. We offer the Internal Scraper with a 5/8" diameter round cutter for the inside of bowls, boxes or goblets. The External Shear Scraper features a square cutter with slightly curved sides for use on the outside of bowls and vessels. The cutters can be interchanged between the two tools. The shank measures 7" and is fitted with a 12" Ash Handle.